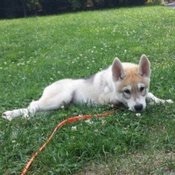 Hi I'm Carlie and Im new to the Tamaskan forum and don't have a Tamaskan yet, but my family does have a lovely shiba inu! She's beautiful and friendly but recently we found out we are going to get a Tamaskan sometime this year or early next year, so we're really excited and will be posting with updates about it! We want a boy and can't decide whether to name him Coda (we're a musical family) or Bellamy but I think once we see him we'll just know what's the best name for him. Hopefully we can train him to be a therapy dog so he can go to hospitals and such but if not I want him to be just an amazing dog. I'm willing to put in the time and effort. Hi Carlie, welcome to the forum! Who is the breeder you plan on adopting from ? Do share some photos of your Shiba Inu in the Other Pets section, we love photos! We plan on adopting from Oslett around early September or to just wait until around next February for Tarheel to have a litter. My family is okay with waiting. And I'll be posting pictures of our shiba shortly! May your Shiba be ever a joy, and may your experience with Tamaskans be as wonderful as mine has been! Hi Carlie! Welcome to the forum! Our boy, Sylvaen Pikachu, will be siring Oslett's next litter so maybe you'll end up with one of our grand-pups.